Knowledge management plays an important role in helping law firms as knowledge organizations create, share and apply knowledge to the needs of law firm clients. This book covers important topics such as characteristics of knowledge, knowledge management systems, objectives and strategies, knowledge processes, change analysis, and change strategy framework. Dr. Martin Apistola teaches and researches knowledge management in law practice at the University of Applied Sciences in Amsterdam, the Netherlands. His Ph.D. thesis concerns knowledge management in large Dutch law firms. For his B.Sc. thesis on models for legal knowledge management, he received the JURIX award for best thesis in the field of AI&Law. JURIX is the Dutch/Belgian foundation for scientific research in the field of AI & Law. He has published extensively on knowledge management in law firms and the use of IT in the judiciary. Petter Gottschalk is Professor of Information Systems and Knowledge Management in the Department of Leadership and Organization at the Norwegian School of Management. He has been the Chief Executive Officer of ABB Datacables and Norwegian Computing Center. He received his M.B.A. in Germany (Technische Universität Berlin), M.Sc. in the USA (Dartmouth College and MIT), and D.B.A. in the UK (Henley Management College). 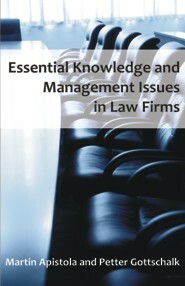 He has published extensively on knowledge management in law firms and law enforcement.